This new video from Glasgow's Honeyblood just popped up on my timeline and it's like someone suddenly declared Summer was open for business. Full of rollicking drums and scuzzed-up guitars, Killer Bangs is like Kenickie having a scrap with The Go-Gos over a distortion pedal - ie it is very good. The lyrics ("I don't wanna have to go on without you / but I have to") may be about the death of a relationship, but the melody couldn't be sunnier. 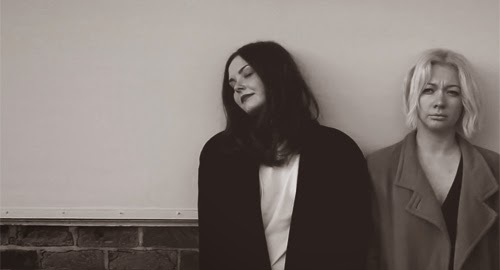 The video captures Stina and Shona's blistering live act, spliced with shots of the band standing against a wall or standing on a bridge or standing near the sea. In a major production oversight, they do not sport "bangs" (that's American for a fringe) at all. What a shame. Killer Bangs is coming out on a limited edition (300 copies!) 7" vinyl - you can pre-order it here. And if you're in the band's hometown, they're playing the Introducing Stage at Radio 1's Big Weekend at the end of the month. And if you're really, really interested, you can read an interview I did with the band on the BBC.